This residence in the Highland Park neighborhood of Dallas, Texas, was designed to appeal to a homeowner with luxury and sustainability in mind. The modern style of the residence reflects the emerging attitude toward modern architecture in the area and uses traditional proportions to fit into the context of the otherwise traditional neighborhood. 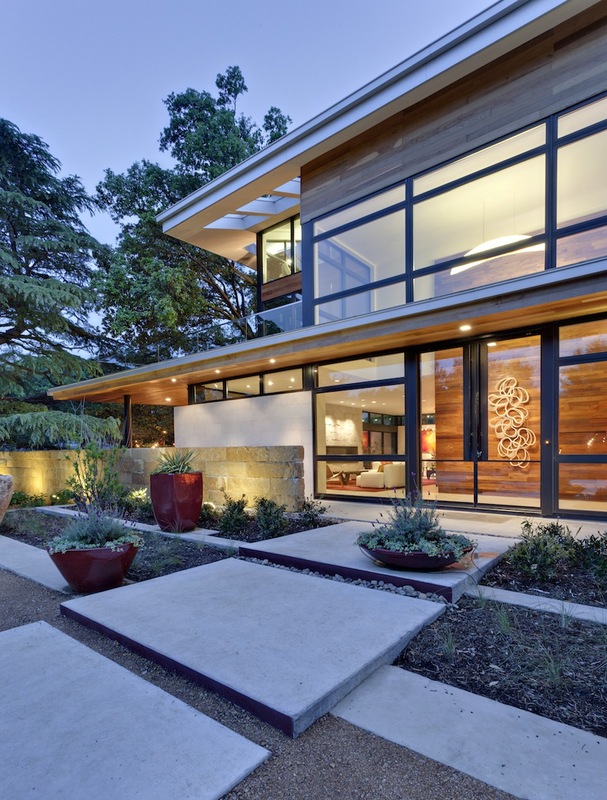 The home received a Gold LEED for Homes rating. This 8,356 SF home has an average electric bill of only $330/ month. The sustainable pro­gram, aimed at minimizing the residence’s impact on the land, will be showcased in local markets in hopes of encouraging nearby homeowners to adopt more sustainable practices in their own homes, whether new or existing. Much of the home’s design was informed by the homeowners’ love of entertaining. We worked to create a plan where the exterior and interior spaces accommodate a range of small and large party settings. The overall palette is neutral, allowing for bolder accents to come in from the lighting, furnishings, and art. Nearly all of the materials were crafted from recycled content, reclaimed materials, and locally produced products. In fact, the porcelain tile on the first floor and in the bathrooms is made of recycled glass from television screens, yet resembles natural stone. The main living and entertaining spaces are arranged on the first floor in an open-plan scheme. The furniture was thoughtfully arranged to allow for maximum flexibility. The media room can be closed off for events or opened up as an expansion of the main living room. The warmth of the teak wood is contrasted by the lime­stone walls that extend inside from the exterior. The second floor is reserved for the family’s private quarters, including a separate living area for guests and has its own kitchen and entry. 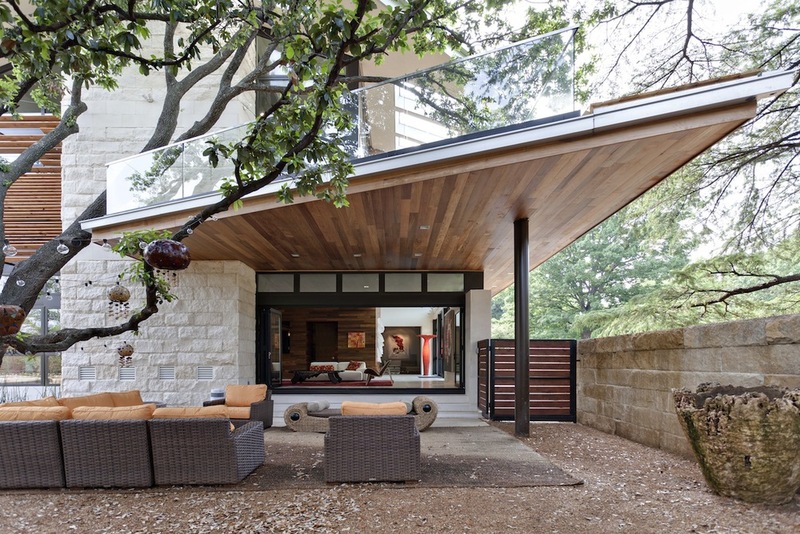 The 75-year-old trees on the property actually serve as inspiration for the overall design of the house, which nestles into the branches and thus creates a “tree house” atmosphere that reinforces the home’s connection to the environment.